The season of Advent developed in the Church over time. Here are 10 facts that you may not know about the roots and meanings of Advent. 1. Advent is a time of expectation and preparation for the birth of the Lord. 2. Advent has a changing start date. It starts on the Sunday closest to the feast of St. Andrew the Apostle (November 30th). It can begin as early as November 27th or as late as December 3rd. 3. Advent marks the beginning of the liturgical year. Advent was chosen to begin the year as representative of the time in history that Christ was not known to us. With his birth the beginning of our faith was founded. The liturgical year ends with the feast of Christ the King, his reign over the Universe. 4. The Advent season has two meanings. It emphasizes both the celebration of Christ coming into the world as a man and also the second coming when the Lord will return again. 5. Hope is a predominant theme of Advent. The Israelites hoped for a Messiah to come, and Christ entered the World. We are hopeful for the arrival of Christ again into the world. 6. Advent is a reminder of the Old Testament promises of the coming of the Messiah. 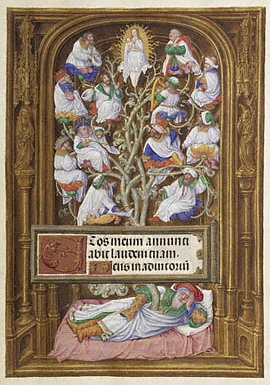 The Advent tradition of the Jesse Tree consists of symbols of the Messiah coming from the line of Jesse (Lk 3: 23-38). Isaiah is often read during this season to remember that we are waiting for the day when the Messiah will come again. 7. Advent focuses on light as opposed to darkness. Christ enters our dark world and casts away the darkness of sin to redeem us. He will come again as the light of the world. 8. Advent has two parts. The first portion the First Sunday of Advent until December 16th is preparation for the second coming of Christ. The second portion from December 17th to 24th directly prepares us for the commemoration of the first coming of Christ - Christmas. 9. The origins of Advent can be traced back to the Church in France. In the 4th Century, the church in France used the period before Epiphany as a time of preparation for Baptism. It was called "St. Martin's Lent" for the 40 days that started on November 11th, feast of St. Martin of Tours. 10. Advent as we know today was developed in Rome. Pope Gregory I in the late 6th/early 7th Century composed many of the prayers, antiphons, and psalm responses. Many themes and ideas we now know can be traced to the Roman Advent Season.